September really came in full force. I'm not talking temperature-wise (it still feels like Summer in NYC to me). I mean, in that busy-full-blown way in which you finally realize the summer is over, you have used up a lot of your vacation time, and are now trying to ration the rest of the fun activities for the year kind of way. Between work, social activities, going to the gym, and more, last week seemed totally out of control for me. And now that Summer Friday's are over, I have to wait until the night to do anything relaxing. Luckily, Pat and I had a really low-key weekend. We had brunch with my friend, Caroline, at Dudley's (one of my all-time favorite places - you *must* get fries if you go! ), went to the Union Square Greenmarket, the Brooklyn Book Festival and hung out with my sister. Oh, and then I went for a run and almost lost my phone in the East River, after I got too close to the edge and over-excited while taking a photo. It flipped over the edge and luckily landed on a patch of sand on the riverbank. I was almost in crisis-mode but then a very kind man jumped down and picked it up for me. Truly a life saver! I was imagining myself phone-less for the foreseeable future. Anyways, tomorrow is Monday, which means I am preparing for bed soon. I've just started The Lying Game by Ruth Ware and I am totally addicted, so I'm looking forward to spending a relaxing evening in bed. Hope everyone else had a great weekend! In a blender, puree apricots, sour cherry jam, and sugar until smooth. In a medium bowl, whisk together Greek yogurt, honey, and coconut milk until smooth. 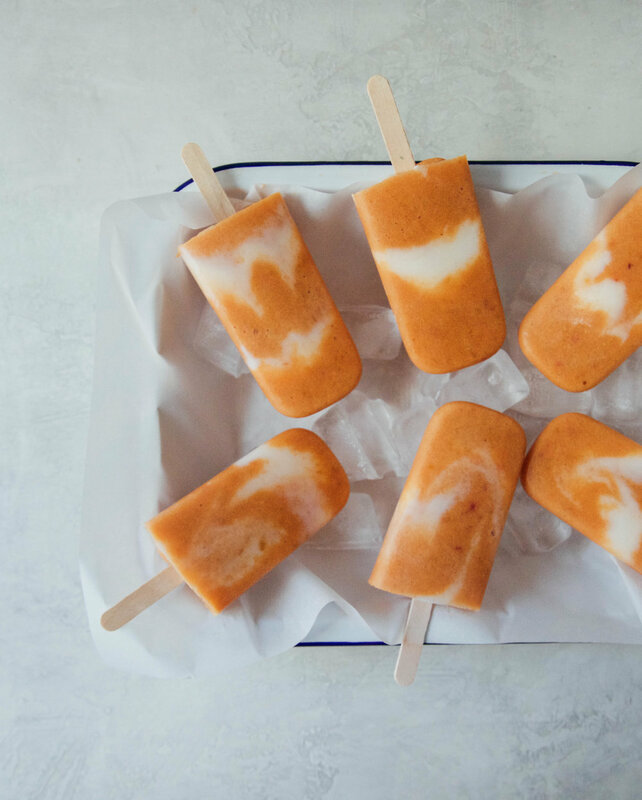 Pour in alternating layers into popsicle molds. Freeze & enjoy.